When parents are in the midst of the daily grind and dealing with traffic and heatwaves, it can be easy to forget the majestic history and art that fills the City of Angels. A visit with the kids to Union Station and the surrounding attractions is a great way to revive your LA love affair. Go ahead, be a tourist in your own city. Next stop: Downtown’s Art Deco Spanish Mission masterpiece. Of course, you could drive to Union Station, but if you’d like to create a full day’s adventure, get on the metro and go train all the way. The Gold, Red and Purple Lines all stop at the station. If you’re driving, you can park in the post office parking lot for the day for a fee. However you arrive, if you have Thomas the Train fanatics in tow, take the opportunity and start your visit at an Amtrak platform to check out a train arrival. Seeing the huge trains pulling into the station is a kick for young conductors. After they’ve had enough life-size choo-choos, head downstairs to the main corridor and step back in time to when the station was built in 1939. Walk through the bustle and into the main waiting area at the east side of the building to take in the intricate art deco design and architecture. And definitely, have a seat in one of the over-sized leather chairs for a photo op. Union Station: Check the station’s calendar, as this transport hub presents lots of live music and art events. Plus, every second Sun. LA Metro hosts Metro Art Moves. This is definitely an adventure for the older set, but worth the time if your train enthusiast is interested in the station. The tour is two hours and explores the art and architecture of the station, plus will get the family access to generally closed areas like the old ticket concourse and the former Fred Harvey restaurant. Olvera St.: Once you’ve basked in the beauty of Union Station, you’ll be greeted by the wonder of Olvera St.—LA’s “oldest street” and part of the historic monument El Pueblo De Los Angeles. The plaza dates back to the 1780’s when Spanish settlers or pobladores established the pueblo. The street was restored in the 1920s and is now a Mexican marketplace that pays homage to the early history and influences of Los Angeles culture. Take a walk down the brick-paved street lined with outdoor merchants, gift shops, restaurants, and cafes. The kids will likely be drawn in by the brightly colored toys, knick-knacks and candy, so have your “no” or limits ready! While you’re on the street, take a walk through the Avila Adobe, the longest surviving house in the city. Also be sure to drop by the América Tropical Interpretive Center where you can view artist David Alfaro Siqueiros’ mural América Tropical. Siqueiros painted the mural in the exterior wall of the Italian Hall in the El Pueblo de Los Angeles Historical Monument downtown in 1932 and it was later whitewashed because of its political nature. The mural was brought back to life and unveiled to the public in 2012. This is a priceless bit of LA history. Check out the Olvera St. website to keep up on annual events. From Dia De Los Muertos and Los Posadas during the holiday season to Mardi Gras Workshops and Blessing of the Animals in the Spring, there are plenty of celebratory events year round. Old Plaza Firehouse: You’ve satisfied little train conductors already, but if you’ve got a future firefighter, this next stop is for them! Once you’ve pushed through the temptation of treats and trinkets, walk through the main plaza and you’ll happen upon the Old Plaza Firehouse, built in 1884. The structure is filled with photos firefighting equipment from the late 19th and early 20th century. Chinese American Museum: Cities shift and Los Angeles is no exception. The site of El Pueblo also happens to be the same location of the former Chinatown, which moved north to make way for the construction of Union Station. But the Chinese American Museum remains in the plaza to mark that history. Exhibitions teach the family about the immigration experience and the formation and dynamics of Chinese American communities in LA. And because of the pueblo’s intertwining history with Chinatown, it happens to host the annual Lantern Festival in celebration of the Lunar New Year. Music, art and food trucks—it’s a true LA festival, taking place usually in early Spring. La Plaza de Cultural y Artes: Just across the street from the pueblo, you will find La Plaza de Cultura Artes, dedicated to Mexican-American culture and influence in the formation of the LA tapestry. Be sure to head up to the 2nd floor to visit Calle Principal, a re-creation of 1920’s Main Street in Los Angeles. Littles can step into a holistic pharmacy put on their lab coats and learn about natural remedies or into an old-time clothing store for a little dress up. This is a great (and air-conditioned!) spot to consider the ways our city has transformed. Also, check out La Plaza’s calendar for free music and film events. Cielito Lindo: If you’re going to eat anything on Olvera St., the taquitos with avocado sauce at this classic spot are a must. Cielito Lindo is located at the north entrance of the street so it can’t be missed. Grab a quick bite and eat on the brick bench to watch the city move by. Mr. Churro: Now it’s time for dessert. If the kids are itching for a treat, walk down the street for a churro. Of course, you can get that classic cinnamon and sugar goodness. But if you’re feeling like stepping out of the box try one of their filled options like cheesecake, strawberry or caramel. Don’t let the options overwhelm you, everyone can try something different, cut them in half and share! Philippe the Original: El Pueblo isn’t the only option. Venture north and visit Philippe the Original for traditional French dip sandwiches. This LA original offers french dips, traditional deli staples like potato salad and coleslaw, soups, grilled cheese and even breakfast (they open at 6 a.m.). You can feed the whole family at a reasonable price and feel comfortable in this casual gem that has sawdust on the floor and a mini model train exhibit in the back room. 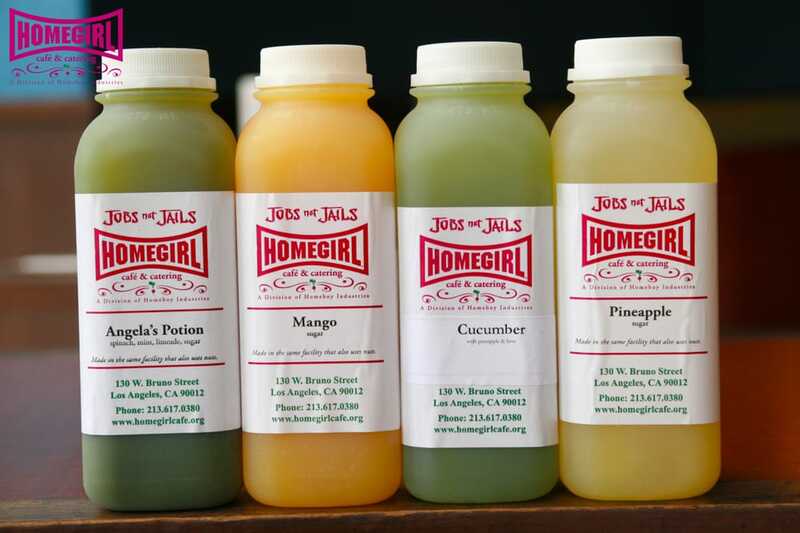 Homegirl Cafe: If the kids are up for stretching their legs just a bit more, head farther north to Homegirl Cafe. The cafe is a part of Homeboy Industries, an organization established by Father Greg Boyle to create work opportunities for at risk and formerly gang youth. The cafe serves up breakfast classics like chilaquiles and great sandwiches (on kid favorite Rainbow Bread), soups, salads and fresh juices. Plus, you can pick up a sweet treat from the Homeboy Bakery case.